Today we donated all proceeds from our ‘La Petite Boulangerie de Noël’ pop-up which opened for 3 days in December in aid of Our Lady’s Children Hospital, Crumlin and The National Children’s Research Centre. This is the latest in a number of fundraising initiatives undertaken in support of this wonderful charity and we look forward to working with them throughout 2019. 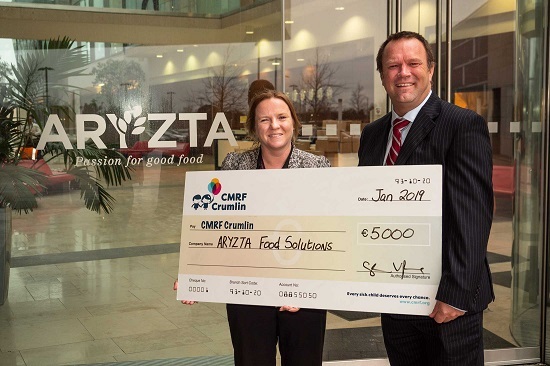 Shane Vaughan, Head of Marketing at ARYZTA Ireland, was on-hand to present a cheque for €5,000 to Sarah Joyce, Head of Corporate for CMRF Crumlin, at our Grange Castle bakery facility in Clondalkin. “ARYZTA is a company that is now increasingly aware of its corporate social responsibility and we could not be happier about this donation, but we won’t be stopping here. We have plans for more initiatives in 2019 which will make a difference to the people who need charity the most. ” Shane Vaughan commented. Sarah Joyce added, “Every year, on average 150,000 children and their families visit Crumlin Children’s Hospital from across the length and breadth of Ireland. Thanks to supporters like ARYZTA Food Solutions Ireland CMRF Crumlin can support Our Lady’s Children’s Hospital so they can deliver the best possible treatments and facilities to their patients and also ensure that vital research into childhood conditions is funded with our partners the National Children’s Research Centre which is the only dedicated paediatric centre in the county”.